The 32nd GST Council meeting was held on 10th January 2019 at Delhi. It was chaired by the Finance Miniter Shri Arun Jaitley. 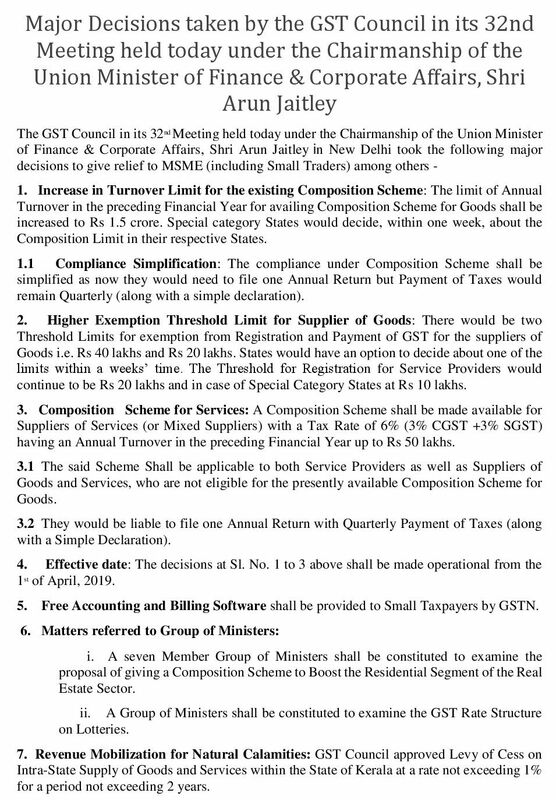 Basic exemption limit for suppliers of goods will be increased from Rs 20 lakhs to Rs 40 lakhs. However, this limit remains Rs 20 lakhs for suppliers of services. For the special category States, the limit for registration is currently at Rs 10 lakhs. This limit in case of supply of goods is increased up to Rs 20 lakhs and such States have been given an option to either choose Rs 40 lakhs or Rs 20 lakhs threshold limit in a week’s time. Those suppliers rendering either independent services or providing a mixed supply of goods & services with a turnover of up to Rs 50 lakhs p.a in the preceding financial year, can join this scheme. The Tax rate is fixed at 6% (3% CGST +3% SGST). Increase in the limit to opt into the scheme will be increased up to Rs 1.5 crore effective from 1st April 2019. Tax to be paid Quarterly and GST Returns to be filed annually. No GST rate cut on sale of under construction flats. Instead, a 7 member group of ministers is formed to study the implications of reducing the rates from 12% to 5% on supply of such under construction properties. The last date for passing the examination for GST Practitioners to be extended till 31.12.2019 for those GST Practitioners who have enrolled under rule 83(1)(b) i.e. who were sales tax practitioner or tax return preparer under the existing law for a period of not less than five years. Free Accounting and Billing Software shall be provided to Small Taxpayers by GSTN. GST council recently met on 22nd December 2018. Catch all the highlights of the 31st GST council meeting. To decide whether or not to include the supply of residential properties and supply of services by small service providers, under Composition scheme. A group of ministers(GoM) is looking into the same. As far as the taxability of the residential properties is concerned, there are two proposals tabled before the council. One, where a tax rate of 5% will be levied on the supply of residential properties (under construction) without Input tax credit (by the option of composition scheme). The other, where the tax rate levied will be 8% to keep it at par with the tax rate on affordable housing. To deliberate whether or not the tax rates on Lotteries must be 12% or 28% GST Slab for private schemes respectively. To take a call on the threshold limit of exemption for MSMEs. A committee by Shri Sushil Kumar Modi was set up in the 30th GST Council Meeting. The committee studied the implication of setting up a fund in case of exigencies such as natural disasters, the recent one being the floods in Kerala. They have proposed to introduce ‘Revenue Mobility scheme’ to address the issues. 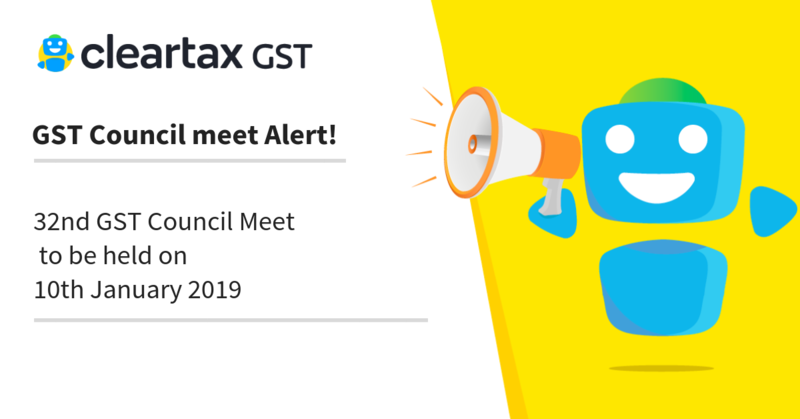 The 32nd GST Council Meeting will be an important one, as it will take a final call on funding natural calamities that have been a serious point of consideration by many Council members for quite some time.